The A372 was released in 1957, being an updated version of the A362 from two years earlier. An example of the set is shown above. Valve line-up was UCC85, 10C1, 10F18, EABC80, 10P14, U404. Like the A362 from 1955, the valves used in this set are a curiously motley selection. 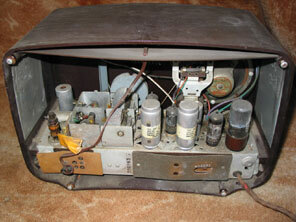 The receiver is only for use on AC mains, however it can be noted that some of the valves were designed for use on AC/DC, (for example the UCC85). Also note that three different valve bases were in use on the chassis. In the rush to develop VHF receivers for release in 1955 this might not be too surprising, as the aim was to have sets for sale that could receive the new waveband as soon as possible (even if the most efficient circuit had not been developed). For the set to appear two years later as a new model number is perhaps unexpected. Shown below is a section of one of the original factory diagrams for this model. 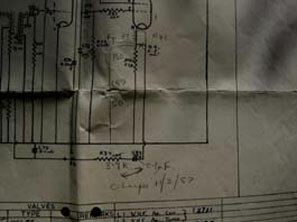 The image is very dark as I have attempted to manipulate it so that some pencilled circuit updates are visible. Here R39 has been changed from 10k to 3.9k, C83 from 0.04uF to 0.1uF, and new capacitor C87 has been included. 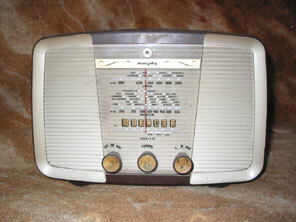 Receivers were subject to minor adjustments to the circuit as experience gained from complaints (fox example poor reception in marginal areas) was used to ensure models performed satisfactorily under all conditions.